A man who stabbed a convicted child killer to death has been found guilty of his murder. 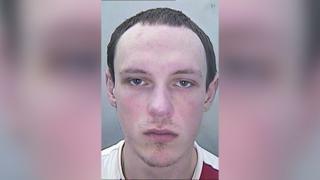 David Gaut suffered 176 knife wounds in the vicious assault by Ieuan Harley in New Tredegar, Caerphilly, last August. Harley's trial heard his victim had been lured to a neighbour's flat, after the past conviction for killing a baby was uncovered. Another man, David Osborne, was cleared of murder and manslaughter by the jury at Newport Crown Court. A third man, Darran Evesham, had been cleared of murder earlier in proceedings after a direction by the judge. Harley, 23, and Evesham, 47, were both found guilty of perverting the course of justice, while Osborne, 51, admitted the charge. The jury took just under five hours to reach their verdicts. The court had heard Gaut moved into a flat next door to Osborne after being released from a 32-year jail term for the murder of a toddler. Gaut told his neighbours he had been in prison for murdering a soldier, but they discovered the truth after searching the internet. In 1985, Gaut had killed his girlfriend's son Chi Ming Shek while babysitting. The baby died of multiple injuries including a broken arm, injured liver and spleen and a fractured skull. A murder trial at Cardiff Crown Court heard that he tried to make the death look accidental. He was convicted of murder and jailed for life in July that year - but was released on parole in November 2017. Gaut was lured to Osborne's home last August where he was murdered by Harley. The court heard that Osborne, Harley and Mr Evesham then tried to clean up the crime scene. Prosecutor Ben Douglas-Jones QC said: "He was duly lured to the flat and he was stabbed to death. "After the murder all three men played an active part in moving the body back to his own home. They dragged him down a covered walkway. "They cleaned Osborne's flat and tried to get rid of bloodied clothing and they set fire to a car, the prosecution say, to destroy incriminating items." A car was set on fire hours after the killing, which Evesham later told a BBC reporter had contained bloodied sheets from the killing, which he claimed had been committed by "three Spice addicts". Police later recovered blood-stained clothing from a riverbank close to where Osborne and Evesham were captured walking on CCTV. The court heard that at least one knife was said to have been used to kill Mr Gaut and a screwdriver was later used to stab his dead body. "The murder in this case was brutal," Mr Douglas-Jones added. "The deceased Mr Gaut himself committed a violent offence. It is no part of our function to judge him for that. He was judged by a jury all those years ago. He was sentence and he served that sentence." Harley, Mr Osborne and Mr Evesham were remanded in custody and will be sentenced on 25 March.